58114 • Tamiya Footwork FA13 Mugen Honda • F102 • (Radio Controlled Model Archive) • RCScrapyard. 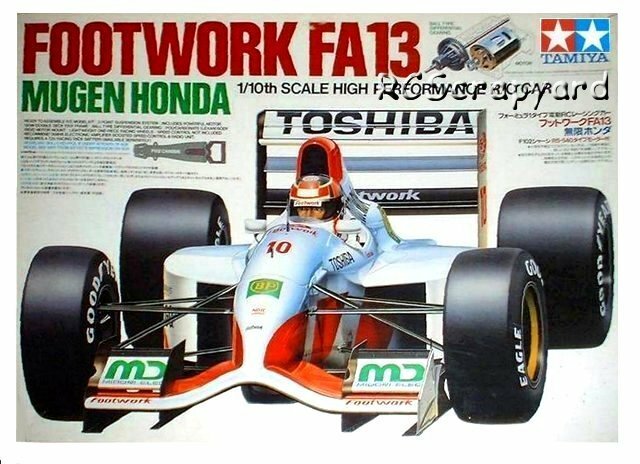 Released by Tamiya on November 10, 1992, this model is of the Footwork FA13 Mugen Honda that raced in the Formula One World Championships in the same year, driven by the Italian, Michele Alboreto and Japanese driver Aguri Suzuki. The Footwork team finished seventh in the Constructors Championship, with four point scoring races to give them a total of six points. This was the third Tamiya Formula One car to employ the replacement for the F101 chassis, the F102. With redesigned narrower chassis for reduced rigidity, cut down T-bar plate and simplified rear wheel thrust bearing installation, the F102 chassis performed well. The more flexible design did, to some degree, improve handling. I used three different sponge tire compounds when I raced 1:10 Scale F1, plus a set of wet weather slicks. Tire wear was always a problem due to the simple fact the smaller the wheel diameter the lower the ground clearance, which on some bumpy tarmac tracks was not good. New sponges were needed after every two or three meetings. If you intend racing your Footwork FA13 Mugen Honda car competitively I would recommend changing the kit supplied plastic and sintered brass bush type bearings for steel ball bearings. The improved performance is well worth the expense.